Overview: The fastest man alive is back with another collection of his Silver Age adventures. Most of the title-building has been done in the first two volumes, so this volume continues on with what has been previously established, with incremental additions to the ongoing story. Welcome to Showcase Presents The Flash Vol. 3. As was common in this era at DC Comics, most issues feature two stories, although there is the occasional full-length story to be found. The Flash’s various Rogues rotate in and out from issue to issue, finding new ways to challenge him each time. We still get plenty of situations with fiancé Iris West complaining about how slow Barry is always, a still-ironic plot point in a book about a man who runs really fast. Barry’s circle of friends is still in place, with frequent appearances from Kid Flash, the Jay Garrick Flash, and Green Lantern. The Flash even has a team-up with Doctor Mid-Nite from Earth-2. There are two notable additions to the DC Universe in this volume. The first is the introduction of the villain T.O. Morrow, an inventor and scientist. He has often gone up against the Justice League and Justice Society and is most known for creating the android Red Tornado. The other introduction found in this volume is Paul Gambi, a tailor in Central City. While mostly forgettable, he becomes to the tailor for all of the villains working in the city, repairing or replacing their costumes following a defeat at the hands of the Flash. 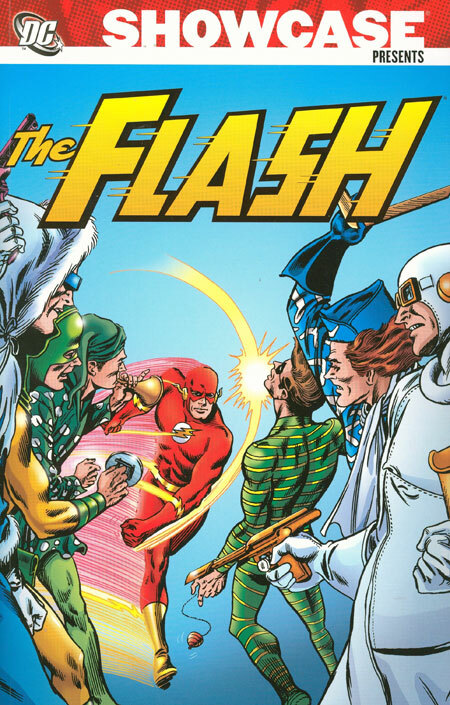 Having all of the villains getting their costumes in one place brought the group together in The Flash #155, and led to the formation of the Rogues Gallery. Why should these stories be Showcased? : The Flash ranks near the top of my list of favorite Silver Age titles from DC Comics. The stories generally hold up; the situations that set-up the stories maybe aren’t as believable, but they aren’t as absurd as those in other titles in this era. We have a rotating team of Broome, Infantino, and Fox that build a near seamless universe for Barry Allen and company. Kid Flash graduates into his own re-occurring feature, in a time when Robin was not. This is a solid collection of the era and should be part of your library with the increased popularity of the Flash in current media. Footnotes: The Flash #160 is a reprint issue. The cover is included in this collection. If you like this volume, watch: The Flash tv show on the CW, which began in the fall of 2014. Sure, this seems like a no-brainer pick, but I think there may still be a few hold-outs among you. Anyway, building on the success of the Arrow tv show, executives worked out a way to bring the Scarlet Speedster back to primetime. Grant Gustin plays Barry Allen, handling the role like he was born to play it. The best part of this show is that it borrows elements from so many different eras in the Flash’s history. The show uses parts of the original Silver Age origin from Showcase #4, as well as the revised origin from Geoff Johns in the 2000s. We have many of the supporting characters, such as Iris West, Jay Garrick, and the Rogues Gallery. There are even nods to the 1990s Flash show, with the inclusion of John Wesley Shipp and Mark Hamill. This is a family-friendly show that I enjoy watching with my kids each week. Overview: Moving like a bolt of lightning, Barry Allen protects Central City as the fastest man alive, the Flash! With one of the most intriguing rogues gallery of any hero, the Flash fights colorful foes on his Earth as well as other Earths! What, other Earths you ask? Yes, sit back and enjoy this read, as we will be crossing dimensions to other earths. Welcome to Showcase Presents The Flash Vol. 2. Picking up where we left things off with the last collection, the Flash still has to face off each month against the likes of Captain Boomerang, Gorilla Grodd, and the Mirror Master. But lets add some more names to his growing list of foes. The Top gives the Flash someone that can fight him with similar speeds; Heat Wave serves as a counterpart (and partner) to Captain Cold; and Abra Kadabra uses future science to become a modern day magician and thief. But the Flash’s greatest threat zooms into the picture as the Reverse Flash (a.k.a. Professor Zoom), an evil doppelganger to Barry Allen. Thankfully, Barry still gets some help from the Elongated Man and Kid Flash, who is sporting a new yellow costume which is totally lost on those of us reading these in the black & white Showcase Presents editions. But the most important comic in this volume (and perhaps the most important comic published by DC Comics since Showcase #4) is The Flash #123. Barry Allen finds out that if he vibrates his body at a certain frequency, he can cross over to a parallel earth. Instead of being in Central City, the Flash finds himself in Keystone City, home to his favorite comic book hero, the Jay Garrick Flash. Locating his idol up in a phone book, Barry arrives on the Garrick doorstep and comes face to face with the Golden Age Flash. Barry appearance encourages Jay to dust off his helmet and get back into his fighting togs, and we now have Flashs on two Earths. 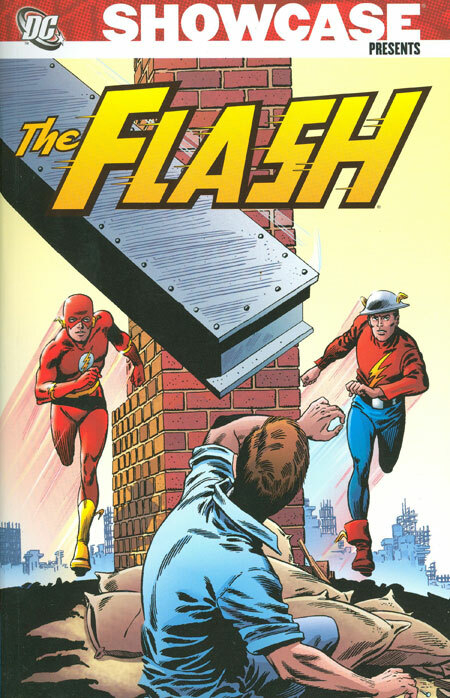 Jay Garrick would appear in multiple issues, including a team-up with Barry where they rescue Jay’s teammates from the Justice Society of America. Though it is not named until Justice League of America #21, this is Earth-Two, and a new continuity is born in DC Comics. Why should these stories be Showcased? : This is a must own volume, in my humble opinion. As entertaining as the Flash stories are during this period, the historical importance of Gardner Fox re-introducing Jay Garrick and subsequently the Justice Society had a huge impact on DC Comics. Fox started developing a continuity to the stories that had been superficial at best with the publisher in years past. The work started here became the framework for uniting the various DC comics into one shared universe. Footnotes: The Elongated Man stories from The Flash #124, #130, #134, and #138 are also reprinted in Showcase Presents Elongated Man Vol. 1. While Joan Williams had been the steady girlfriend of Jay Garrick in the 1940s and 1950s, it was their appearance in The Flash #123 where we learned that the two had finally gotten married and settled down into a nice house in the suburbs. If you like this volume, try: tracking down the Crisis on Multiple Earths: The Team-Ups trade paperbacks from 2005 and 2007. 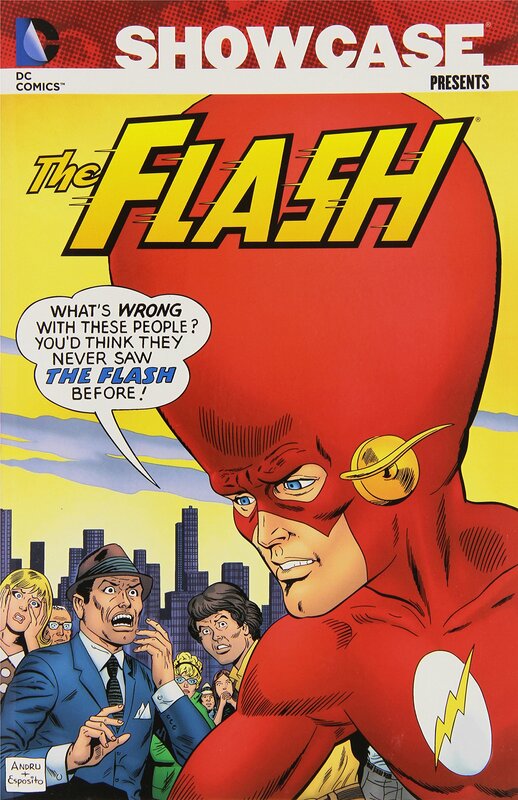 With the success of the Jay Garrick Flash appearing with Barry Allen, the DC Universe books from Gardner Fox started teaming up the Silver Age characters with their Golden Age counterparts. 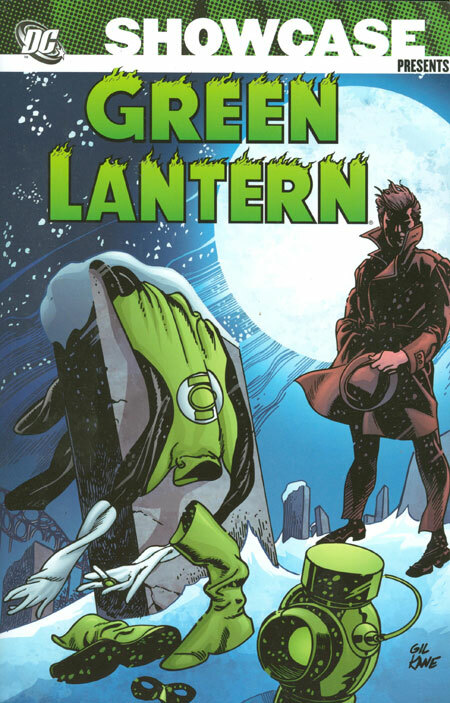 Alan Scott appeared with Hal Jordan in the pages of Green Lantern, and Al Pratt teamed with Ray Palmer in The Atom. Other books featured Justice Society characters, such as Doctor Fate & Hourman or Starman & Black Canary teaming up in the pages of The Brave and the Bold before it became a Batman team-up title. While some of these issues can be found in other Showcase Presents Volumes, these two trades are a handy resource to put all of the these issues in two collections. Overview: “Atomic batteries to power. Turbines to speed.” Strap in, old chum, as we travel the 14 miles into Gotham City. Wait, that’s the wrong Batman series from the 1960s. I was referencing the Batman TV series. Surely the TV series had no impact on the comic books, right? Wrong! Sit back and enjoy the ride with the third volume in the Showcase Presents Batman series. There’s not a moment to lose! Now, according to lore, the TV series producers went to DC Comics looking for help. The show needed a new female character to help attract female viewership. Based on a suggestion by William Dozier, DC artist Carmine Infantino whipped up a design for Batgirl, a.k.a. Barbara Gordon, Gotham City librarian, and daughter of Police Commissioner Gordon. Making her debut in Detective Comics #359, Batgirl quickly became a fan favorite and a core member of the Batman Family. 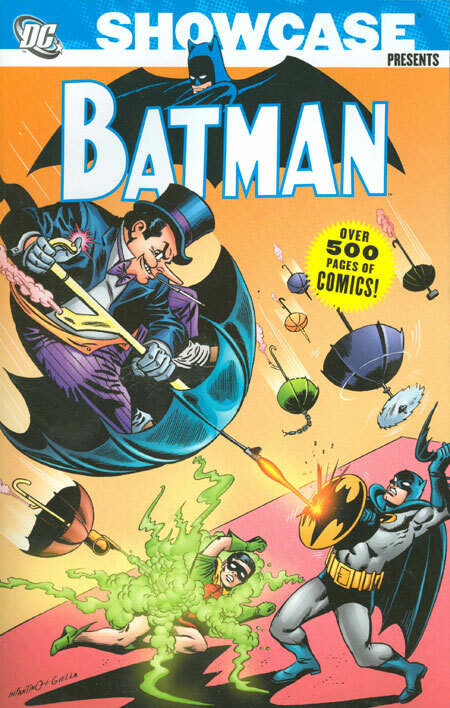 Reflecting the success of the TV show, the comics in this volume started featuring many of the colorful characters to challenge the Dynamic Duo. Lots of Penguin and Joker and Catwoman stories here! And even though they never made it to TV, Blockbuster and Scarecrow get some page time in this collection. While we start to see some signs of an over-arching storyline starting to develop under the guidance of editor Julie Schwartz, these stories remain primarily one-and-done and could be read in any order once you read Batgirl’s first appearance at the start of this collection. Why should these stories be Showcased? : This is the volume everyone wants when you think of Batman in the mid-1960s. You get the million dollar debut of Batgirl. You get the second appearance (and the first in Showcase Presents) of Mr. Freeze. Batman’s rogues’ gallery of colorful characters (pun intended) is all here: Joker, Penguin, Catwoman, Riddler, Mad Hatter, Blockbuster, Scarecrow, Killer Moth, and more. As a fan, I would be hard-pressed to find something missing from the Batman mythology that is not contained somewhere in this volume. This may be volume three in the series, but I would rank this #1 on my must-own list. Footnotes: The stories from Detective Comics #359, #363, #369, & #371, and Batman #197 were also reprinted in Showcase Presents Batgirl Vol. 1. The Robin story from Batman #192 is also reprinted in Showcase Presents Robin the Boy Wonder Vol. 1. If you like this volume, try: Batman ’66. This series is based completely on the 1960s Batman television show. The characters in this comic bear a passing resemblance to the characters from the show – such as Adam West as Bruce Wayne/Batman and Cesar Romero as the Joker. Others may look slightly askew, such as Commissioner Gordon or Chief O’Hara. The writers and artists vary from story to story. This series is available first as a digital comic, and then two stories are collected later as a print comic. The print comics have been collected into multiple trades and hardcovers, so this should be very easy to find in any format. If you are a fan of the TV show, which was finally released on DVD in 2014, or if you are a fan of the Batman stories collected in this Showcase Presents, then Batman ’66 should be on your pull list. Overview: In brightest day, in blackest night, no evil shall escape my sight. Let those who worship evil’s might, beware my power, Green Lantern’s light! With that, let’s dive into Showcase Presents Green Lantern Vol. 3. Green Lantern is an interesting title of the era, as any type of story seems reasonable with this character. From traveling to the future or to parallel universes; or roaming the vast reaches of space to battling criminals in Coast City — it all works with the Hal Jordan character. In many ways, Green Lantern is the definitive science-fiction character of the 1960s. Having worked with him in the Justice League-Justice Society meetings, Green Lantern has a series of solo team-ups with Green Lantern of Earth-2 in this collection. Alan Scout’s ring is powered by magic, and is vulnerable to anything made of wood, which is in complete contrast to Hal Jordan’s will-powered ring that is vulnerable to anything yellow. Let’s just hope that these two do not have to face crooks armed with yellow baseball bats. Gil Kane’s art is the true star of the show in this volume. Although Kane’s career spans 50+ years, it is his work on Green Lantern that remains among the most-memorable of his career. This volume is an excellent example of his artistic brilliance. Why should these stories be Showcased? : To date, each volume in this line is better than the previous. At this point, the creators (John, Gil, and Gardner) have fully established the character and his world. Now, we see Green Lantern’s universe expand, with team-ups with the Flash and Zatanna, and with the introductions of Alan Scott and Guy Gardner. (John Stewart fans, be patient – his time is coming!) 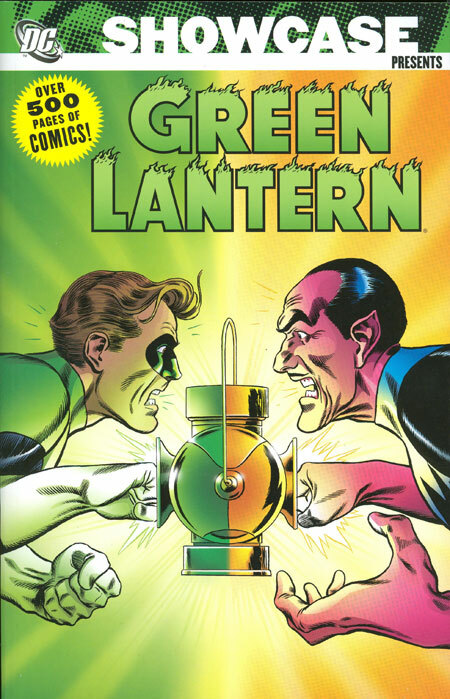 As with the prior volumes, Green Lantern remains one of the titles most-impacted by the lack of color in the Showcase Presents line. Thankfully, the Silver Age comics were very diligent in explaining the Green Lantern ring’s weakness to anything yellow each and every time it occurs. Anyway, I think this would be a good spot to pick up Green Lantern if you haven’t so far. In particular, this should be a must own volume for Gil Kane fans! Footnotes: After making appearances in The Flash and in Justice League of America, the Earth-2 Green Lantern, Alan Scott, finally makes an appearance in Green Lantern #40. Alan Scott, along with his pal Doiby Dickles, would make frequent appearances in Green Lantern going forward. If you like this volume, try: the Green Lantern: Sector 2814 series of trade paperbacks from the last few years. These books collect the Green Lantern title from the 1980s – before, during, and following the events of Crisis on Infinite Earths. Hal Jordan finds that he needs to walk away from his role as defender of Sector 2814. But two men – John Stewart and Guy Gardner – step forward to take on the mantle as Green Lantern of Earth. 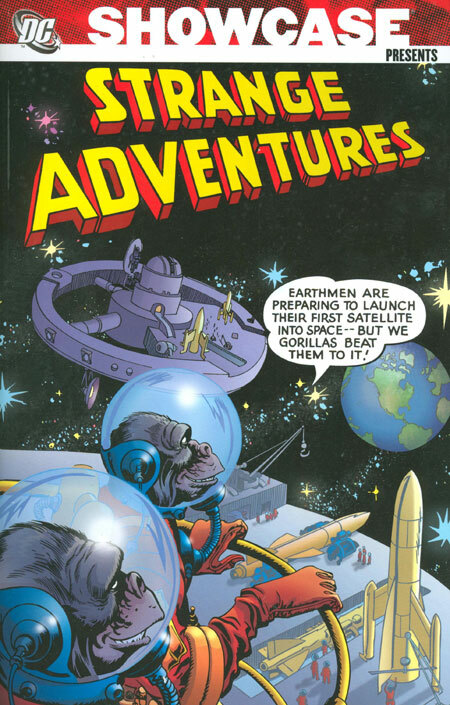 Three volumes have been released so far, collecting the work from Len Wein, Dave Gibbons, Steve Englehart, Paul Kupperberg, Joe Staton, and others. These books are an easy way to explore some great Green Lantern Corps stories that often get overlooked.